We just put out the 2014 Winter-Spring Buyer’s Guide and are happy to say that the Civility Yoyo topped the list along with the Prodigy as the most recommended high-end metal yoyos. The Civility looks very similar to One Drop Project, not surprising since Colin Leland had a big hand in designing this throw. However I should mention One Drop did not participate in the production of the Civility. The Civility has very simple elegant look to it. The finish is beautiful and the anodizing feels flawless against your skin. This throw begs for grinding, and speaking of grinding I was able to pull off thumb, finger, and arm grinds with ease. With its slightly rounded and gentle V-shape, the Civility felt very comfortable and stable in my hand. It never felt like I didn’t have control of this yoyo. For a 69 gram throw one may worry that the Civility will feel too heavy during play. One might also fear that your finger will take damage during extended sessions of play. Well….. one would also be wrong! Honestly the weight distribution on this throw is great! If I did not know how much this yoyo weighed, I would have guessed it was more in the range of 66 grams rather than close to 70. I was able to go through my trick sets without issue. Speed combo, slacks, whips, and technical tricks all went smoothly. So I decided to try out this throw in the arena it was specifically designed for…..learning tricks. I chose 3 random *new* tricks off the net and attempted to learn them. I was very impressed with how this throw reacted during this experiment. During long pauses the Civility kept its very powerful spin. I was also able to correct my position on the string very easily when landing badly. During all 3 tricks there was never a time I didn’t feel in control of the Civility. While spinning at the end of my string I didn’t notice any wobble. It spun so smoothly and for such a long time, if it weren’t for the slight clinging of my bearing I would have thought it stopped. While the Civility does not come in a splash design colorway, nor is it the most flashy throw on the market, it definitely accomplishes what it was meant to be….a great metal throw for someone who wants to learn complicated tricks. With a price tag of just 90 bucks I would say it is competitively priced compared to other throws in its category. This fact alone might just be the tie breaker for someone who is in the market for such a yoyo. However, with better known models and brands out on the market, only time will tell how well this throw ends up selling. While I don’t think it will end up as my *Favorite Yoyo Ever* I definitely have to say the Civility has found its way into my daily rotation for a very long time. The Civility is definitely a pleasure to throw and I suggest picking one up if you have the means. As an update, I am still using the Civility and it continues to be in my daily rotation. I am even thinking about buying a second one. That Civility is something to be proud of! After months of soul searching, we have taken the plunge and switched our domain to yoyotricks.com. It is a milestone for any company when they can use the domain that perfectly describes what they do. Luckily for us, the change was very small, we just had to add a second “yo”. What does this mean for you? Not much, except it is now easier to tell your friends where to learn tricks: yoyotricks.com. You can still access our site by going to YoTricks.com, and we are still going to call ourselves YoTricks. Just don’t be startled by the extra “yo” in the address bar in your web browser. This week we have a lot of exciting news! We just launched a new starter yoyo, exclusive to YoTricks.com (just in time for Christmas), and we have an update on the coming release of the Civility yoyo. In July 2013 we here at YoTricks received the sad news that the Luminator yoyo we had used to teach most of our tricks had been discontinued. In hope of creating a new flagship starter yoyo, we contacted YoYoFactory to see if they could replace the Luminator for us. We wanted a yoyo that was inexpensive, played great and easy with no modifications, but could easily be modified to handle more difficult Unresponsive Tricks. 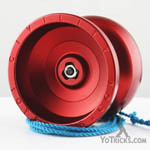 With our combined knowledge and vision, YoTricks.com and YoYoFactory produced The Sage. Like the Luminator before it, the Sage Yoyo is easy to pick up and play. It comes with a thin bearing, for responsive play, but can easily be modified with a Center Trac bearing for unresponsive play. The Sage is available on its own, or in a Yoyo Starter Pack (recommended for new players) and Yoyo Pro Pack (for players ready to take the leap into more advanced tricks). As many already know, it had been our hope to launch the Civility Yoyo in July or August of 2013. Due to a mistake in the manufacturing, however, this was not possible and we had to remake all the yoyos. We are now excited to announce that the Civility will be available on YoTricks.com sometime in January 2014. As soon as the Civility is made available to our customers onYoTricks.com we will notify you through our website, our newsletter, our YouTube channel, and on Facebook.